Oops because my computer ate my pillow post. I have zero idea where it went or what happened to it, so now I'm on the hunt before I give up and rewrite it, probably to publish it a day late. 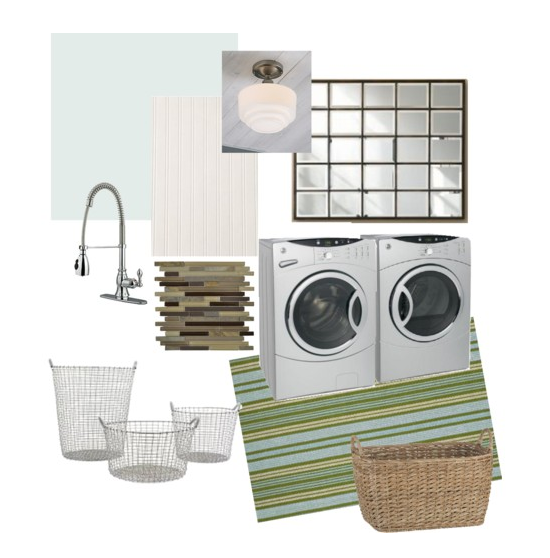 In the meantime, I'm offering up the plan for my basement laundry room. The things I loved the most about my inspiration photo were all the great windows in the space, and the fabulous Dash & Albert rug. I loved the rug so much I decided to bring it directly over into my design. Probably not going to buy it, though. I'll try my hand at this new rug painting thing that's circling the web and try to achieve a similar look... especially since I just picked up a flatweave rug at Target on clearance and was wondering how to use it. How serendipitous! The windows, however? I'm fresh out of luck since the room is in a basement and I can't magically make windows appear.... or can I? Mwahahaha. My plan is to use framed out mirrors to create the look and feel of windows, which will help boost the light and hopefully make it feel a bit less dreary-basement while adding some cheerful vibes to the space. Finally, my plan is to replace the ugly ceiling tiles with beadboard, paint the walls a lighter color than the current aqua, build a pedestal for the washing machine and dryer, and add some polish to the space with a new sink and faucet. Hopefully for as little cash as possible. Wish me luck! Love the new banner. It's my exact yard color inspiration!! Can't wait to see your finished product!